The weather is crappy. It’s miserable and windy and rubbish. But it’s June and we shouldn’t have to be eating beef stew. These noodles in their spicy broth makes life seem much much better 🙂 It’s just the right combination of light (so you don’t feel like you’re made entirely out of dumpling) yet spicy (so you don’t feel like you’ve been short-changed out of a decent meal on a miserable day). It’s also incredibly quick, easy, and pretty good for you too. I needed to use up the leftovers from our Garlic Lemon Chicken, but it would be great with just veg or tofu. The advantage of using the chicken is that it had rather cunningly been flavoured with the right kind of things, and when I stripped the carcass down I squeezed the limes which had been in the cavity all over the meat. Clever girl. 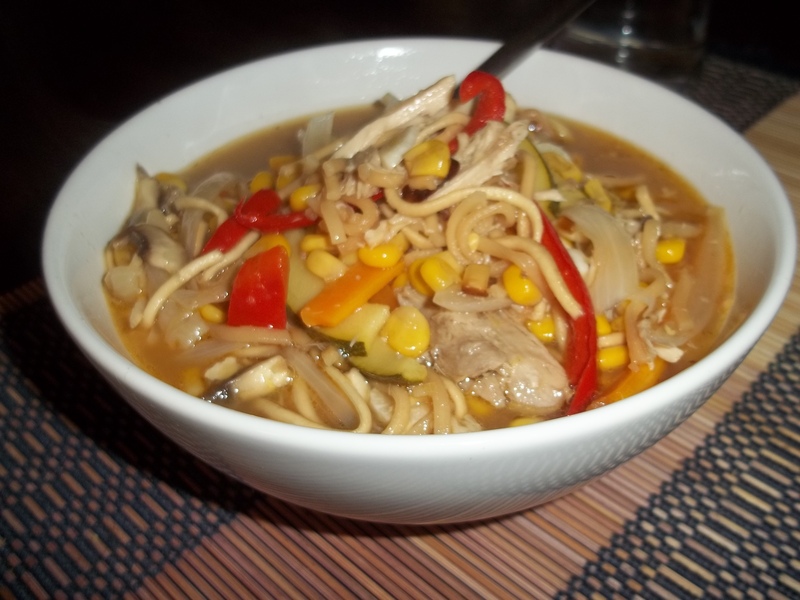 You can also use uncooked chicken, which poaches in the broth like in the Chicken and Sweetcorn soup I made a couple of months ago. Slice your veg into fairly fine strips. Cut the chicken or tofu into chunks and set aside. Warm through the stock, sesame oil, lime juice, garlic and galangal. Add the veg and simmer for a couple of minutes. Add the chilli a little at a time, stirring through and tasting. It is very easy to over-spice so try not to overdo it. Dissolve the sugar into the soup and season with soy sauce if necessary (I didn’t need to as ham stock is very salty anyway). Mine wasn’t quite sour enough so I added some cider vinegar as I didn’t have any more lime juice. Add the chicken or tofu, if using. Simmer until cooked or warmed through as necessary. Break some noodles into the soup and simmer until cooked. Serve immediately.